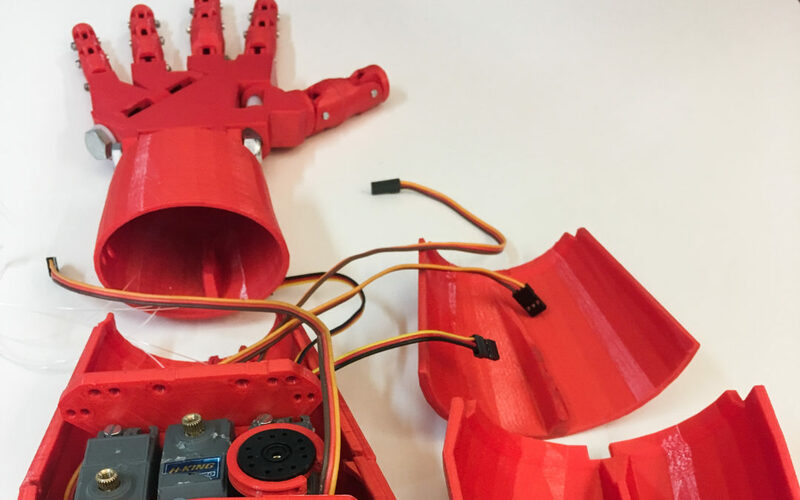 A group of students from the mandatory Electricity Workshop course is working on a multifunctional robot hand that can be remotely controlled with the user’s own hand movements. 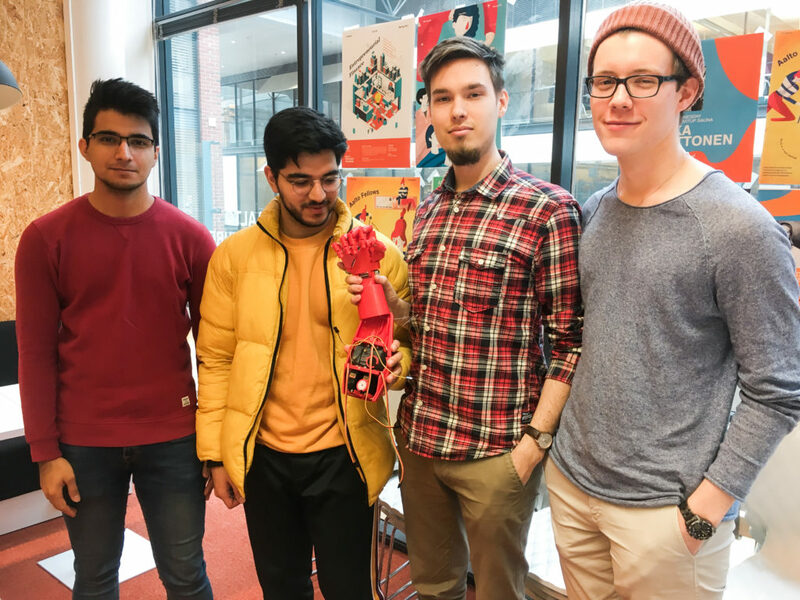 A robot hand that can be remotely controlled by your own hand movements may sound like the future or something that’s being developed in a tech company in San Francisco, but that’s exactly what four Aalto students are currently working with on a mandatory course. ELEC-A4010 Electricity Workshop is a bachelor level course that’s mandatory for electrical engineering students but is also electively attended by students from many other fields. During the course, students design and build a working prototype of a product that uses electricity. Despite the course being bachelor level, some of the projects are truly ambitious, like the robot hand. Currently, the hand is just a prototype, but the group believes they can finish it by the end of the course. When operational, the robot hand built out of 3D-printed parts picks up a signal sent from a special glove the user is wearing. The sensors in the glove register the movement and position of the user’s hand and fingers, and the robot hand replicates whatever the glove does. The idea started as a claw to disarm bombs, says Aaro Packalén, one of the students in the group. Soon they decided to make it a hand instead, in order to have more applications. And there are many applications indeed. The original idea of disarming bombs is still there: if the hand was attached to a camera-wielding robot, an expert could control a disarming robot anywhere in the world with his or her own hands over the web, without ever going close to the bomb. Besides disarming bombs, the hand could be used in hazardous environments such as bio labs, or it could be scaled down to perform surgeries when high precision is needed. One potential field of application stood out during user research, which has been part of the course since AVP teacher Meri Kuikka started co-teaching the course with the goal of designing devices with actual market potential. The group had thought about the hand’s potential in virtual reality, but during the interviews, they realized the user has no means to tell the robot hand how hard to squeeze – it only mimics the position and movement of the user’s hand and fingers. The group is already working on this problem, and upon solving it the hand could be used in several virtual reality applications as well. The group feels they’ve learned a lot during the course, not only about programming and mechanics like they expected but also about user research and project management, which they have found interesting. What they’ve liked most about the project so far is the complexity of the project and the constant problem-solving. “You don’t really get to do this kind of stuff in everyday life”, Packalén says.